This program is written in pure C programming language. The interface of the C program is just like Turbo C/C++ compiler like interface, and it also provides some gialog boxes same like the Turbo C/C++ compiler. 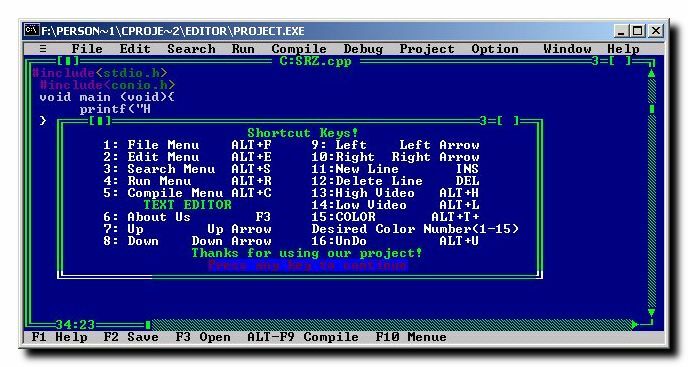 It has menus just like C/C++ compiler, text formatting options and also provides options to change font color. The dialog boxes are coded seperately so that they migh be used in other program or utility. Hot keys/Short cut keys for all the menu options. About us dialog box to show some information. Open file dialogto select the file to open. Arrow keys to move up-down and right-left through out the texteditor window.